Living a Fit and Full Life: Found: Psalm 23 by Sally Lloyd-Jones is a Terrific Board Book for Little Ones! Found: Psalm 23 by Sally Lloyd-Jones is a Terrific Board Book for Little Ones! From the bestselling The Jesus Storybook Bible, with over two million products sold, comes Found based on Psalm 23. Written by Sally Lloyd-Jones and illustrated by Jago, little ones will fall in love with this padded cover board book that reminds them of God’s Never Stopping, Never Giving Up, Unbreaking, Always and Forever Love. Sally Lloyd-Jones is a Brit who came to the US in 1989 "just for a year." She's still here. 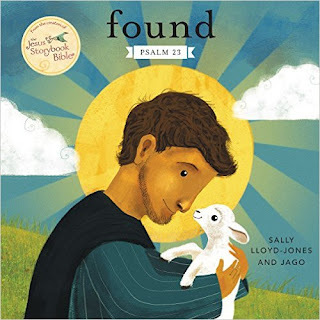 Found: Psalm 23 by Sally Lloyd-Jones is a terrific board book for little ones! As a Christian mom of 4 I'm always on the hunt for good board books for little ones. Found: Psalm 23 by Sally Lloyd-Jones is an incredibly adorable book that all of my kids enjoy reading before bed. Found by Sally Lloyd-Jones reminds little ones that God' love is forever and that's definitely a message I enjoy sharing with my little ones. My kids have been asking to read this book every night before bed as the love the story as well as the beautiful illustrations throughout. Found: Psalm 23 by Sally Lloyd-Jones is a beautiful board book for little ones and I highly recommend it! You can find Found: Psalm 23 by Sally Lloyd-Jones on Amazon, Barnes and Noble and other bookstores.